I picked this interesting little print up at auction a couple of weeks ago. Although it’s not the sort of thing that I would normally have been drawn to – being Victorian rather than Georgian and apolitical to boot – I found the idea of a movable print so engaging that I decided to blow the dust off my wallet and take it home anyway. 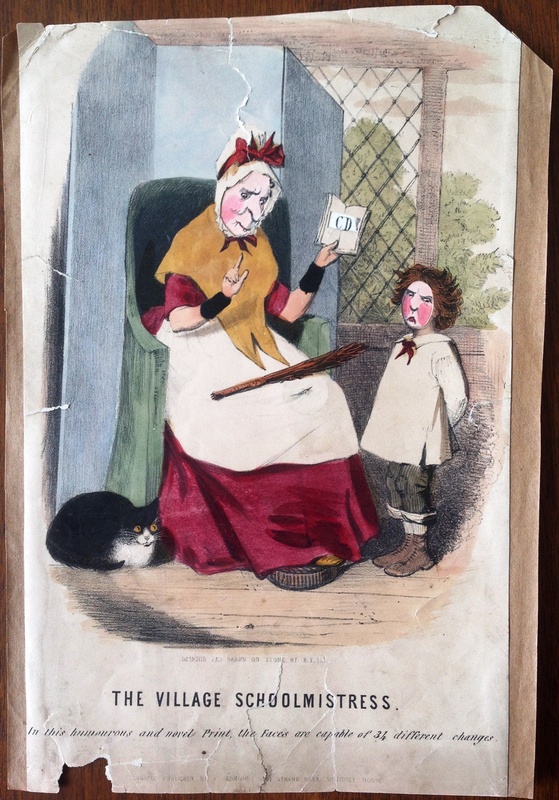 The print’s title is The Village School Mistress, it was lithographed engraved by R. Evan Sly (fl. 1839 – 1847) and published by Charles Edmonds of 154 Strand (fl. 1845 – 1847). Sadly this was one school mistress that was showing every sign of her 170 years, and a programme of cosmetic surgery that Dolly Parton would have been proud of was called for in order to make the old girl presentable again. The toy consists of a single piece of paper with three holes covering the face of the school mistress, her pupil and the text book. Behind it sits a paper wheel which can be rotated to change the faces of the characters and the letters displayed on the book’s pages. 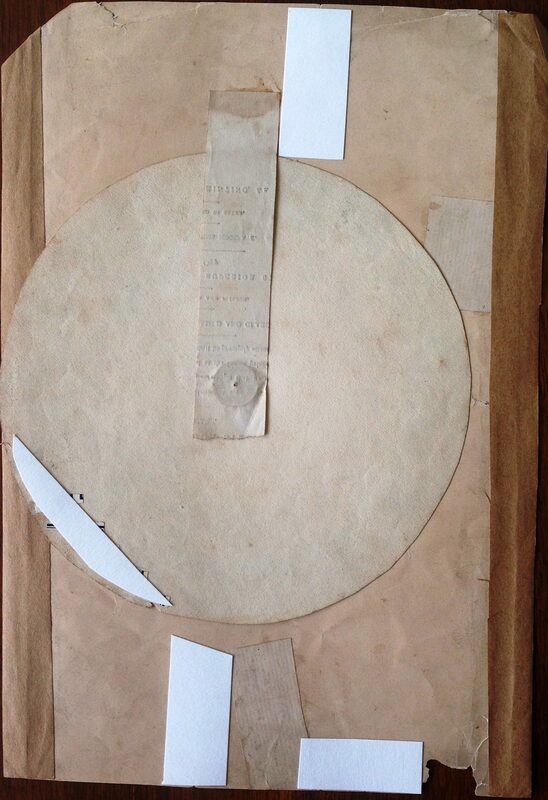 If you look at the photograph of the rear of the print you will note that the wheel is held in place by a strip of paper which also has text printed on its verso, indicating that it was probably recycled from the publisher’s leftover stock of books, pamphlets or magazines in order to save money. As the subheading of the print indicates, the wheel can be turned to produce 34 different different sets of faces. R.E. Sly is something of a mystery. His career seems to have begun during the late 1830s, when he is known to have published at least one humorous print from an address near St Pancras. It’s possible that he was a relation of the engraver and printer Stephen Sly, who was active at exactly the same time and operated from premises located off Fleet Street and later in Soho. Few of Sly’s prints appear to have survived but those that have suggest that he was working as a jobbing engraver by the mid-1840s and that he may have specialised in moving prints such as this. Note the reference to the “curious and very entertaining mechanical print”. 154 Strand had been home to publishers and booksellers for almost a decade before Edmonds arrived on the scene. In May 1836 the premises had been acquired by William Blackwood, publisher of the Lady’s Blackwood Magazine of Fashion, who remained there until March 1844 when ownership transferred to the “publisher, bookseller, printseller and stationer” Thomas Houlston [1.] 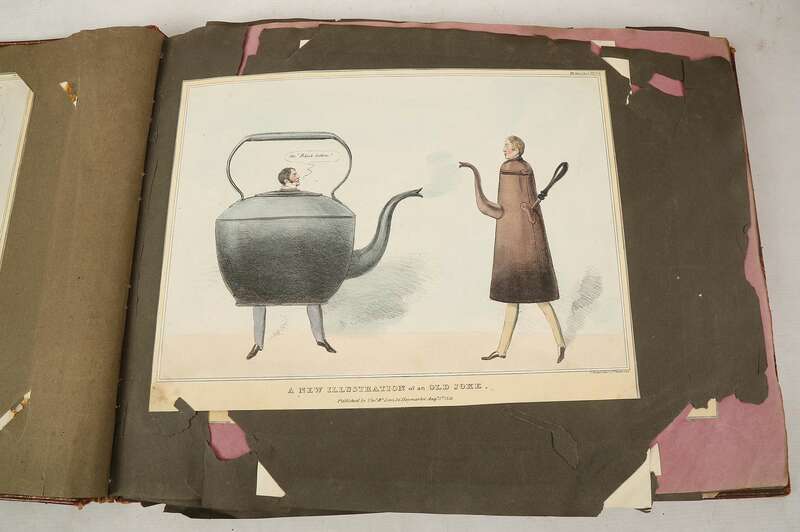 Houlston published a variety of different prints, on subjects ranging from courtoom portraiture to sentimental potboilers, however he also commissioned a series of “New & Amusing Mechanical Prints” from R. Evan Sly. Only a handful of these survive, one of which can be found in the British Museum’s collection and another in an old online auction catalogue from 2005. 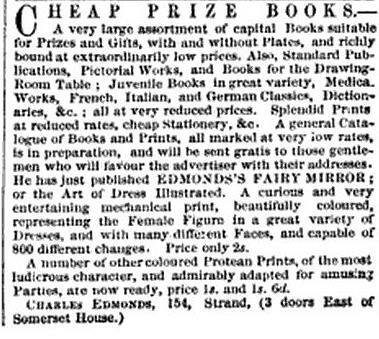 The fact that Edmond’s continued to publish the series after he took over the shop at 154 Strand in April 1845, is probably indicative of a wholesale takeover of Houlston’s business, with Edmonds’ perhaps being a former employee or junior partner of the shop’s former owner. In the end, Edmonds’ was to remain in business for just two and a-half years before being declared bankrupt in November 1847. I’ve added this print to my for sale section. Click at the link on the top of the page or here for more details. The Standard 28th May 1836, Morning Post 1st January 1844, Morning Chronicle 29th March 1844, Morning Chronicle 14th April 1845, York Herald, and General Advertiser 27th November 1847. Whilst we tend to view satirical prints a valuable items which are to be individually collected, displayed, and considered in their own right, that’s not necessarily the way in which contemporary consumers would have approached them. 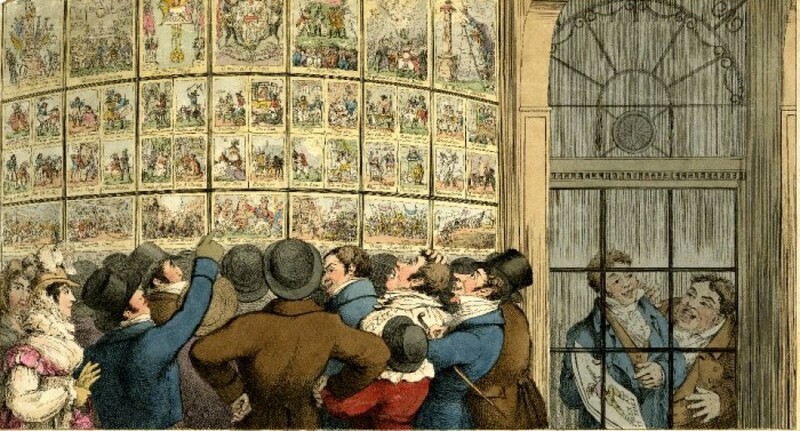 The numerous references to caricatures being placed into albums, scrapbooks and folders, which we find in newspaper advertisement, diaries and publication lines of the period, suggests that satirical prints were typically acquired and viewed in multiples, with each print receiving perhaps only a moment’s consideration from the owner. 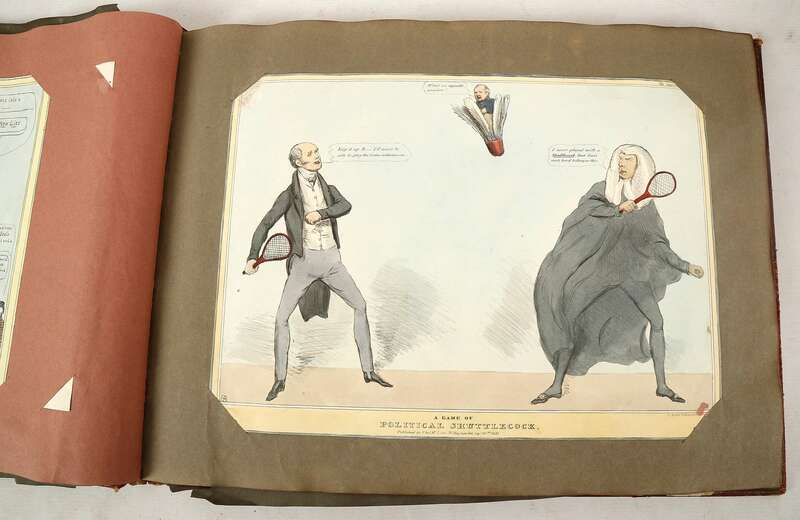 The loss of this collective view of satirical prints is in part due to the poor survival rate of contemporary caricature albums. As the scarcity and value of eighteenth-century prints has increased over time, albums have been broken up by successive generations of antiques dealers so that individual prints could be sold onto collectors at a higher price. It’s therefore always pleasing to come across a surviving album of caricatures which has survived completely intact. These images are of an album which has recently surfaced on the market and will appear at auction in the UK in the next few weeks. The binding carries the armorial crest of the Marquess of Londonderry and contains 130 coloured prints by the likes of John Doyle and other prominent West End caricaturists of the 1830s. The album carries an auctioneer’s estimate of £700 – £1,000, which is perhaps rather optimistic given the relative lack enthusiasm for Doyle’s works amongst many collectors. Whatever the outcome, let’s hope that this lovely item remains in one piece for a few more years to come. G.M Woodward original – Laconic Conversation or Men of Letters!! A quick post to share this image of an original caricature drawing by the humorist G.M. Woodward which sold at auction earlier today. Woodward, as readers of this blog will no doubt be well aware, exercised considerable creative influence upon the English satirical print trade in the years between 1790 and his death in 1809. His lack of skill as an artist and engraver meant that he was never able to produce print in his own right, but his ready wit and eye for a good pun meant that publishers frequently sought to pair him up with caricaturists who were capable of bringing his ideas to life. 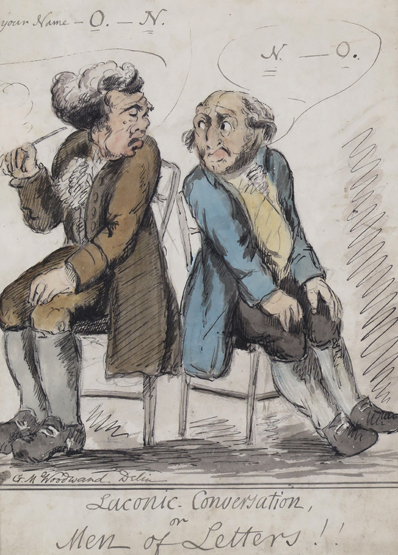 As such, Woodward worked with such satirical luminaries as Thomas Rowlandson, Isaac Cruikshank and Richard Newton, as well as a plethora of less well-known names. This drawing, with its play on the contemporary habit of redacting personal names from prints, is typical of Woodward’s oeuvre. It shows two elderly men eyeing each other up in a rather unfriendly manner. The one of the left asks: “Is you name O. ____N? To which the other lazily replies “N____O”. It’s been executed in pen, with a watercolour wash and measures 9½ x 6¾inches. Woodward’s signature can be seen in the bottom left-hand corner of the design. No printed version of the image is known to exist, so we must assume that the drawing was either a proof for a caricature which was either never commissioned or has subsequently been lost, or a private commission from a contemporary collector of Woodward’s original works. Although the Derbyshire record office possesses a large collection of original drawings by Woodward, as well as the remnants of his personal papers, they are comparatively rare on the open market. It is therefore not surprising that a complete drawing such as this achieved the respectable hammer price of £700. The Idiot, or Invisible Rambler was published in Boston, Massachusetts, in 52 weekly editions between 10th January 1818 and 2nd January 1819. Although each edition was published anonymously by someone writing under the pseudonym ‘Samuel Simpleton’, a notice that appeared in the 28th August 1818 edition, stating that “Subscriptions for this paper [are] received by N. Coverly, Milk Street”, provides some indication of the likely identity of the author and / or publisher of the magazine. Nathaniel Coverly Junior was a second generation printer and publisher who operated from premises located at No. 16 Milk Street in Boston. His father had begun publishing religious tracts and political pamphlets in the late 1760s and by the 1810s the family business had broadened to include a diverse range of popular literature on subjects ranging from children’s stories to lurid accounts of notorious murders. The Idiot has been described as the first American comic, on the grounds that it was the first illustrated publication to feature a recurring character and make use of speech bubbles. Personally, that’s not a definition that I would agree with. The term ‘comic’ implies a primarily visual medium and, apart from the woodcut caricature which appeared in the masthead of each edition, The Idiot was still entirely text-based. Nevertheless that it is true that the magazine represents an evolution in the market for graphic satire in America during this period, as caricature began to spread beyond the large single-sheet prints of the War of 1812 era. 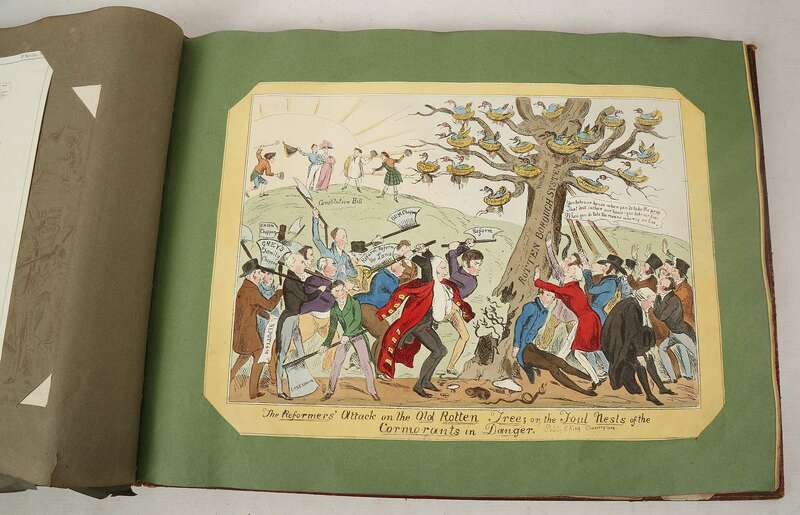 Inspiration for the magazine undoubtedly came from William Combe and Thomas Rowlandson’s extraordinarily successful Dr Syntax series, a trilogy of illustrated poems published in London between 1809 and 1821. The poems tell the story of an accident-prone priest who gets into all manner of scrapes whilst touring England on a series of extended vacations. Coverly (or his author) copied the idea wholesale, transforming Rowlandson’s Dr Syntax into a bumbling fish-out-of-water settler named ‘Brother Jerry’ who is supposedly recounting his misadventures on the Ohio frontier. Each edition was therefore written in rhyming couplets and accompanied by an illustration (see above) of Jerry on his travels. Unlike Combe and Rowlandson’s work, The Idiot combined the frivolous humour of its central character with the role of a local newspaper, including genuine notices of births, marriage, deaths and advertisements in each issue. This was presumably because the American market for ephemeral literature was still in its infancy in this period, and therefore incapable of supporting a weekly publication which served no practical purpose whatsoever. 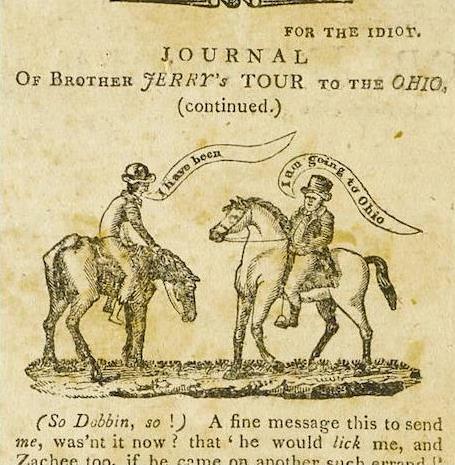 The Idiot ceased publication on 2nd January 1819. A notice which appeared in the final edition stated that its proprietors had been bought out by the publisher of The Kaleidoscope, a similar weekly pamphlet which mixed light-hearted content with local news. Following the merger, The Kaleidoscope changed its title to the Boston Kaleidoscope and Literary Rambler and would remain in print for a further ten months before being brought to a halt in October 1819. * Surely there must be some sort of a prize for shoehorning an Iggy Pop reference into an article about early nineteenth-century satirical prints?